Recipe submitted by Carol Hamilton, President & General Manager, L'Oreal Paris. Yogurt Parfait is a healthier alternative to ice cream, but without sacrificing that delicious taste. You can add a variety of flavors to the parfait, too. Include vanilla, lemon, peach, or berry yogurt and top it off with your favorite cereal. The combinations are endless! Make sure you’re using low-fat or non-fat yogurt if you want to enjoy the healthy taste of it. Why head to the soda shoppe when you can make your own tasty treat at home? 1/4 cup berries (blueberries, raspberries, strawberries, blackberries ... or try mango chunks, banana, just about any fruit or berry will do). 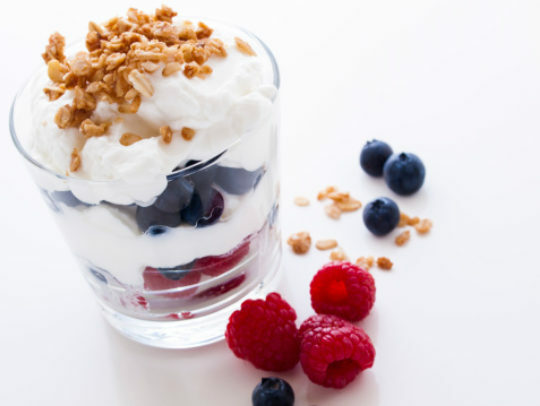 Alternate ingredients in a parfait glass beginning with half of the yogurt, followed by berries or fruit, and then granola or cereal. Baker’s Tip: The nutritional value of this recipe can vary greatly depending on the brand and flavor of the yogurt, and the type of granola you choose. Be sure to read the labels to ensure you're choosing reduced-fat or non-fat brands of yogurt, and low-fat granola.